In the rainy months of early 2013, deafening roars filled the air in the otherwise quiet and tranquil Selenkay conservancy. Our Guardians in the area had been reporting tracks of two male lions for some days and it seemed, perhaps, that these newcomers had finally decided to take on Ndelie, the current resident male lion in the area. The roaring sessions continued for a couple of nights; then a deep silence descended on the area, a silence as dark as the night itself. Life, we thought had returned to normal, but little did we know that a coup had just taken place and life would never be the same for some of the lions in Selenkay again. 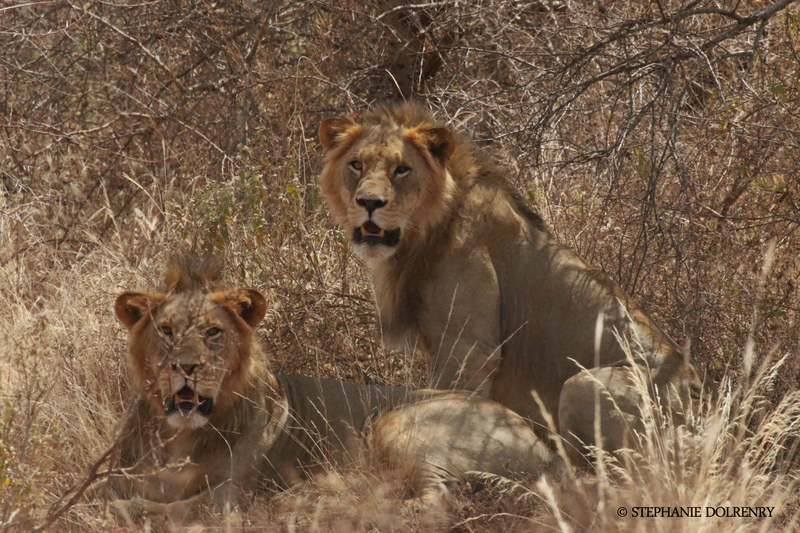 Soon after, we responded to several lion depredation incidents in Mbirikani and we found Ndelie, many miles away from his territory in Selenkay. We immediately realized that the two new young males had managed to overthrow him. He was exiled from his family and had returned to the area where he had come from many moons ago. 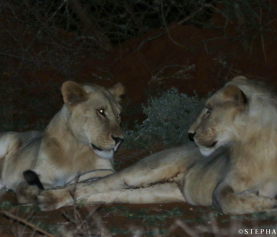 Within a few months, we found one of the new males mating with our collared female Selenkay and there was no sign of her young cubs Ndelie had sired. These mysterious young males were shy, elusive and uncomfortable with vehicles. In fact, we could hardly get a photograph of them owing to their constant disappearing and extreme skittishness. However, with time and we believe due to the confidence and calmness of the females they were mating with, we slowly were able to get photographs of them and begin to attempt to figure out who they were and where they had came from. Since then the two young males took over Selenkay areas, they have never looked back. They killed off any young cubs of Ndelie and immediately went about the serious business of reproduction and they have been very successful. They have so far sired 14 cubs from four females and have just mated with the fifth female who they have recently ‘stolen’ from another male in northern Eselenkei. Over the year, they have grown bigger, both physically and in confidence. The shyness is gone and has been replaced by sheer confidence and a ‘don’t care’ attitude. The Guardians have given them Maasai names – Loorngojine (he of the hyena) and Loosinkiran (named after the largest hill in the Conservancy). At height of their takeover, Lorngojine killed a hyena and left it on the road for all passersby to observe and know who was in now in charge. Loosinkiran got his name because he often patrols the area surrounding the hill. Although we now have names for these two males and know them from their personalities, preferences, the females they have mated with and the many cubs they have already produced, we still have no idea where these two males came from, exactly how old they are, who they are related to, etc. We have so many unanswered questions. The Guardians ask repeatedly if there is any way we can figure out where they came from and who they really are. The lion monitoring team of the Lion Guardians program have been recording lion sightings for 10 years, as a result we have developed a detailed database that provides us with the family history of all the lions in our coverage area over this time period. 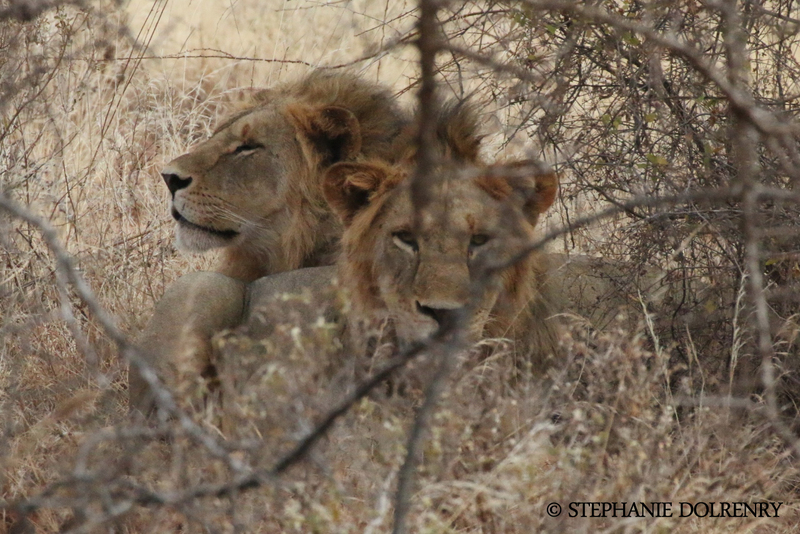 But these two males are not in our extensive lion database – they seemingly appeared out of nowhere! They were not born or raised in any of the Lion Guardians’ areas of the Amboseli ecosystem nor do they seem to have originated from Amboseli National Park. What we do know from our observations and those of others, is that male lions can travel vast distances (200 to 400 kilometers) in search of new territories as they disperse. We can also make some logical deductions about Loosinkiron and Loorngojinye based on our observations of them. Their shyness and skittishness confirms that they are probably not from a protected area where they would have been accustomed to seeing and hearing vehicles. The direction from which their tracks were first seen by our Lion Guardians, indicate that they could have come from Laing’arrunyoni hills in the Matapato section, an area currently outside our jurisdiction. However, we cannot be certain. 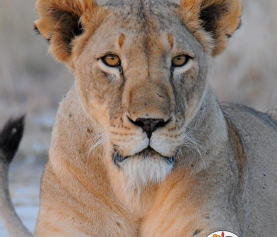 To be certain, we need a new tool and that is why we are developing the Lion Identification Network of Collaborators (LINC) – a cutting edge technology that will enable us to communicate and collaborate with lion researchers and interested citizens to better understand and conserve lion populations across broad landscapes. But why is it so important to know where they came from? Today we know that lions, especially male lions, can move large distances between populations as they move from their natal home ranges. But we are not sure of which populations are healthy enough to send out dispersing males, how often this happens, where they reach, etc. This activity of dispersing is one of the most important ecological processes, although it remains one of the least understood. As human populations continue to rise and put more pressure on lion rangelands and isolating lion populations, it is increasingly important to understand their dispersal characteristics and how we as conservationists can effectively play a role to maintain connectivity and thus a larger viable metapopulation. Migrating individuals can rejuvenate populations where local extinction may have occurred, as well as enable a “rescue effect” in which immigrating individuals protect a dwindling local population from extinction. LINC will allow us to better understand these migration patterns, the movement from populations and thereby enable more effective lion conservation on a broader scale. It will allow us to pinpoint and work on priority areas between various lion populations to ensure lion survival across Maasailand and East Africa. 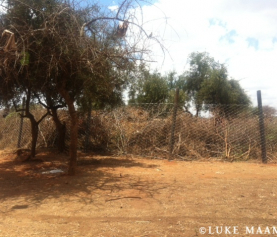 It takes a community to conserve lions and preserve cultures – help us Make the LINC.